HiNative: The Review Can it answer "The Question?" Ask on a forum / Reddit / etc. Try to find someone who knows someone who can help answer your question. Wait a long time while you do those things. It's for times like these that HiNative was birthed (presumably out of the loins of their flying squirrel mascot). How do you say this? Probably the most common thing you'll be asking. Maybe you want to write something but can't quite figure out the right words or grammar. Maybe you have zero clue at all. Somebody can help you out. Does this sound natural? Maybe you wrote something but you want to make sure you don't sound weird (or like an online translator). Someone can fix your sentence and make it sound better. Please show me example sentences with ~~ Let's say you have a certain word, phrase, or particle that you're not quite sure how to use. This question type lets you request example sentences using your target expression so you can see it in context. What does this mean? When you want to know the meaning of a Japanese word, phrase, or sentence, this will come in handy. It's like "How do you say this?" in reverse. What's the difference? 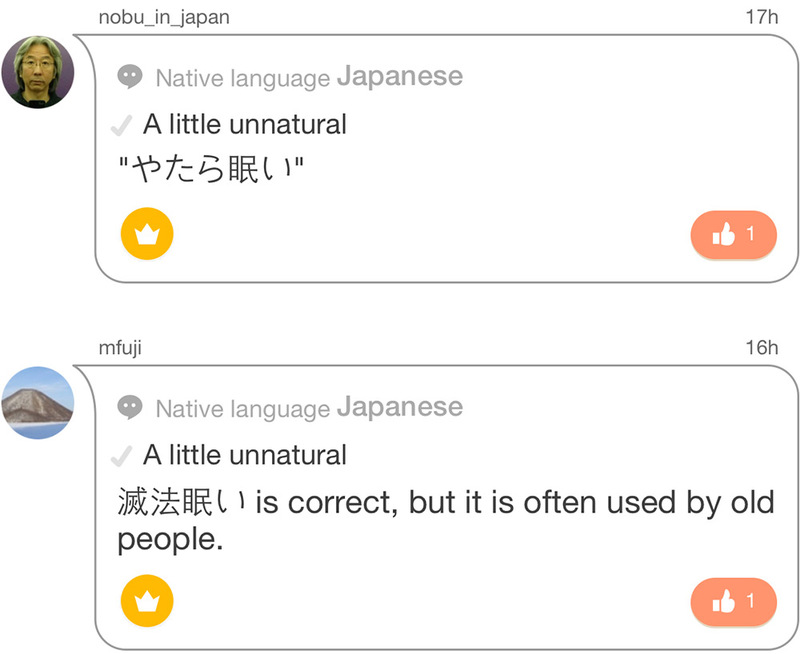 With all the synonyms that Japanese has, not to mention all the similar-seeming words that have subtle differences, this is a useful one. Please show me how to pronounce ~~ You can ask how you'd say something in Japanese. A native speaker will then record the answer for you so you can practice. How's my pronunciation? You can ask if your recording sounds natural or not. Great for pronunciation practice. Ask about a country or region Find out things related to culture, etiquette, travel, or anything that has to do with the country you're interested in (I assume Japan). Free question Lots of potential here. Ask literally anything! I'll throw out some ideas later in the review. Note: this question type is only available on the mobile app. The interface itself is simple and easy to use, with the bottom bar simply consisting of Home, Notifications, Bookmarks, Profile, and a big "Ask" button smack dab in the middle. I like how they don't try to overcomplicate things. A lot of your time is going to be spent in the Home, Notifications, and Ask sections, so let's go through each of those really quickly. 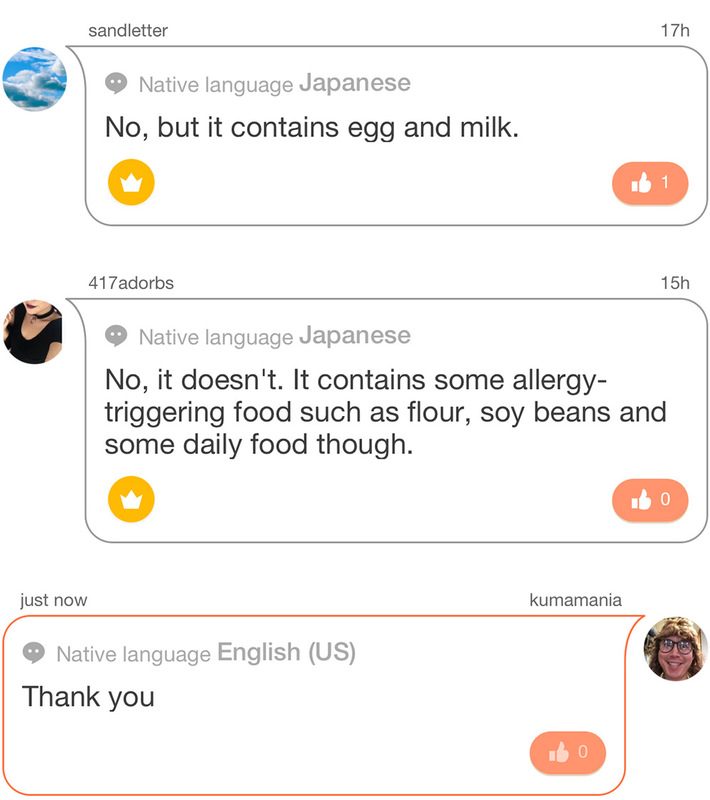 Home: This is where you can find questions posed to you (and other native speakers of your language). Just like Lang-8 (the parent company), it's expected that you give back to the community that gave so much to you. It's a language exchange, after all. So if people are helping you out, you should check in and help them out too! Also, you can use the home section to look at questions that other people like you are asking. This is a good way to pick up tidbits of information, as well as to see if you would have answered a question the same way. There's a lot of knowledge to be gained from what others ask. 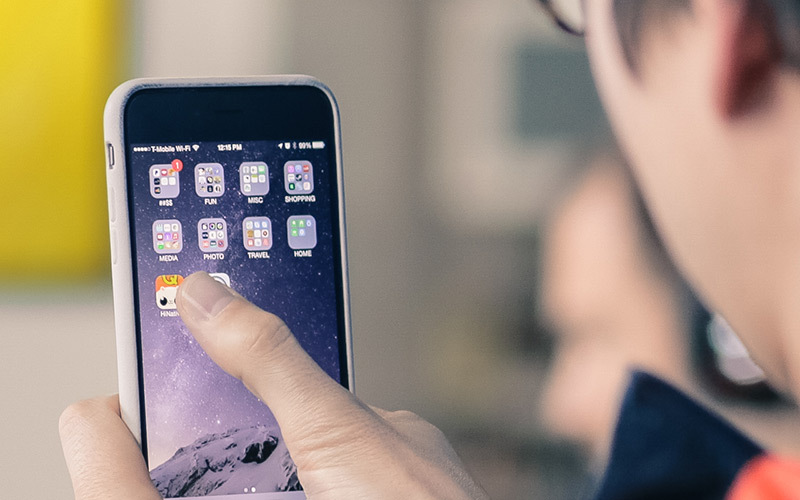 Notifications: Of course, you want to know when people answer your questions! Ask: Ask, ask away! That's the whole point. 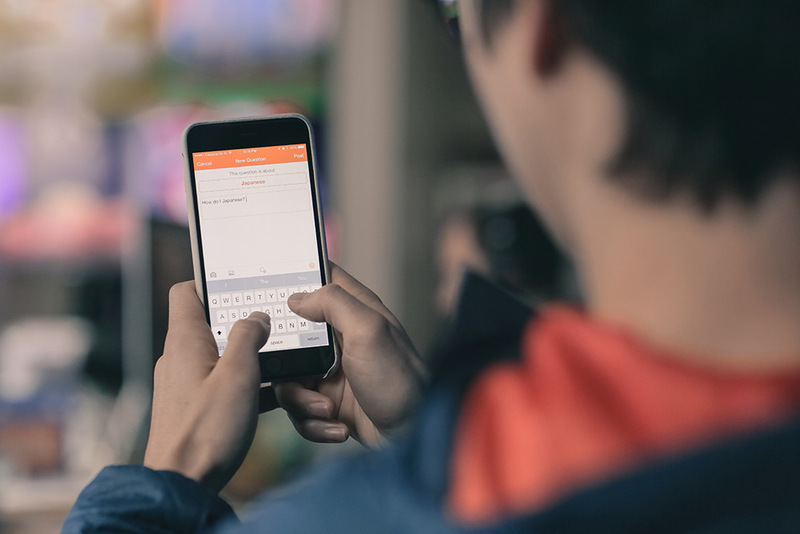 What kinds of questions are people asking on HiNative? Just swiping through them, I found quite a variety, and most of them were getting answered well too. You don't have to wait a really long time for someone to get back to you. Here are some real questions I found while swiping through. 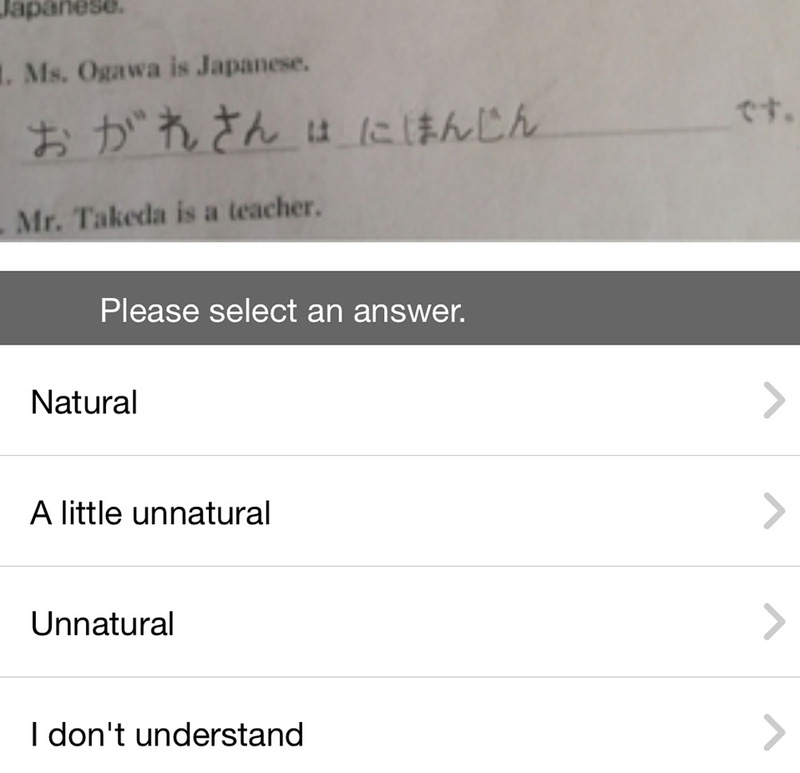 In this question, someone wrote something (it looks like on their homework), and they want to see if it sounds natural. Because they chose the "Does this sound natural?" question format, it automatically added multiple choice in there, making it easy for someone to answer quickly. This person wanted to know the difference between two words. They specified they only wanted example sentences, so that's what they got. You can see there's a thumbs-up counter there too. Instead of answering a question again the same way, you can simply agree with it by giving it points. This adds to the reliability of answers as well. If you're feeling iffy on someone's answer, this is a good way to confirm or disconfirm your suspicions. The "Native Language: ___" next to their name helps as well. Right here, someone wanted to know how to use the word めっちゃ. They got some examples as a response, as well as an explanation. This is what HiNative was made for! You don't want to ask small questions like this to any single, real-life person (at least not very often). After a while they'll get tired of all your questions. With the Internet, you can spread out your incessant question-asking so that no single person gets irritated at you. Here somebody found some text. They took a picture of it and asked a question about it. I could see this being useful especially if you're in Japan. Take a picture of a sign, product, or whatever else, and figure out what it means. As I said earlier, HiNative is a community, so you get out what you put in. You get more questions answered when you answer more questions, and answering questions gets you "points"—quick points and quality points, specifically. Quick points are earned by answering questions, and some questions are highlighted as giving more quick points than others, so keep an eye out for those. Quality points are earned when you answer a question and someone who speaks your language "likes" it, or when the question-asker highlights your answer. HiNative takes these as signals of quality and gives you points in return. The more points you earn, the higher up your questions will appear in the feed, making it easier for you to get answers to your questions. The more you give, the more you get, so make sure to balance out your question-asking with some question-answering. I went ahead and created a fake account to play with (and also so I wouldn't sully my personal account with dumb questions). First, I answered questions for people learning English. It was a pleasant experience and very easy to do. 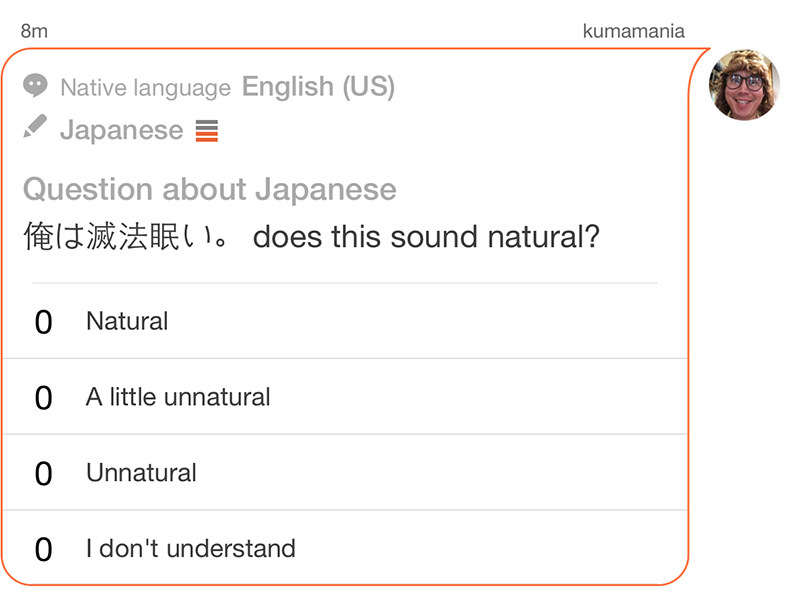 Some answers simply required me to choose how natural or unnatural something sounded. For others I did a short, one-sentence explanation. The nice thing about questions like these is that the answers are very short, so they don't take up much of your time. This way you can learn a little, many times throughout the day. It seems like some people do this by focusing on the "does this sound natural?" question format. They treat it like mini Lang-8 entries, where they put up one sentence and find out how to fix it. People tell them how natural it sounds (or doesn't sound) and then write up a better version of it. If you do this ten times a day, you're learning quite a bit, actually. I can see how it would be a good study method. Feel free to steal it and use it for your own. 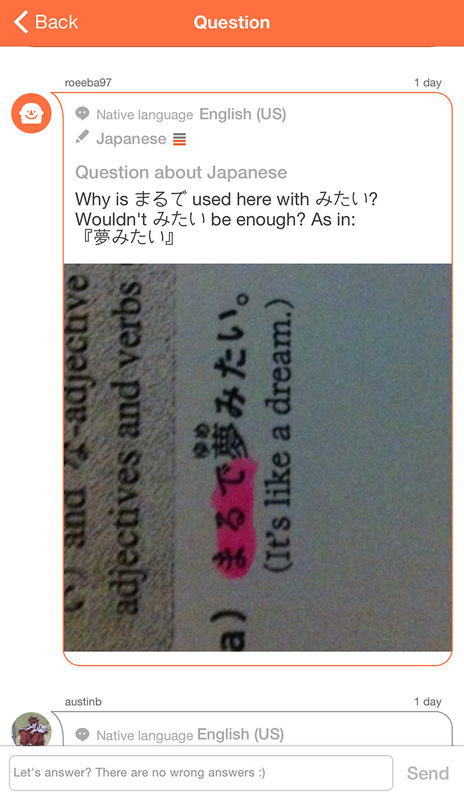 One thing that surprised me was that questions for English came in from non-Japanese English languages as well. When the question is in English, about English, it doesn't matter who the asker is. They can be Chinese, Russian, or Brazilian. 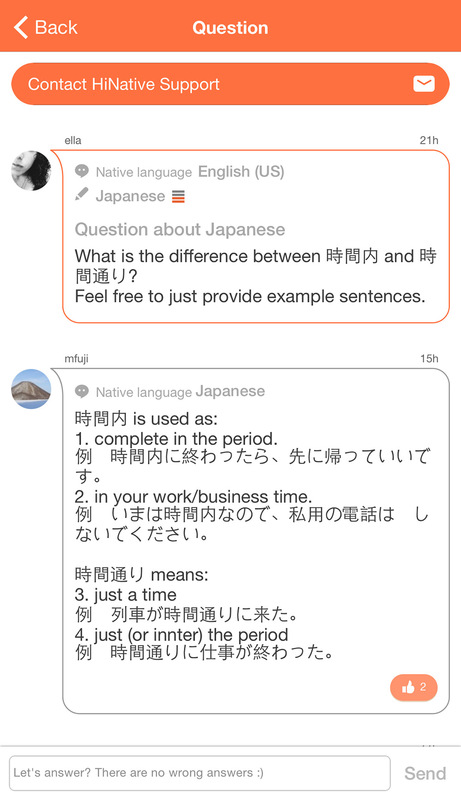 I was expecting to only see Japanese people asking about English (because that's how Lang-8 works). Instead I saw Japanese as well as Chinese native speakers joining the fray. I'm not sure why I didn't expect this, but it's actually kind of nice because you aren't as limited to who can help you. 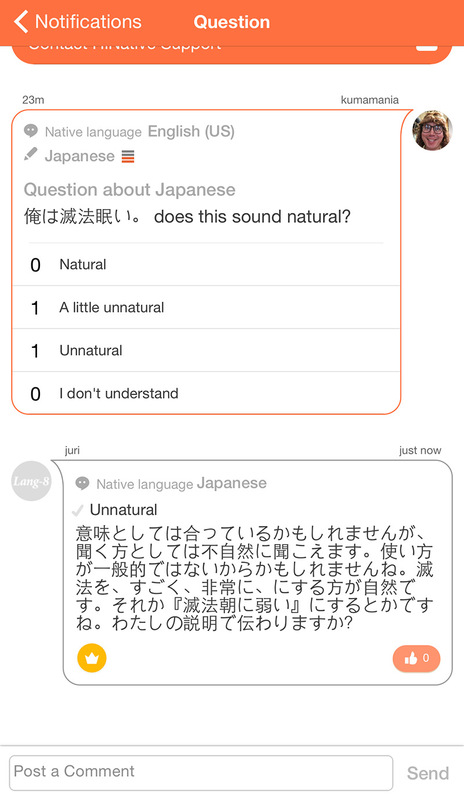 Question #1: 俺は滅法眠い。does this sound natural? This was a simple one. I just wanted to see how quickly people would respond to an "is it natural?" question. I asked 俺は滅法眠い, which means "I'm super sleepy." But the word 滅法 is pretty weird / uncommon, so I wanted to see how people reacted to that. I got my first answer within fifteen minutes, which seems pretty good to me, though it was just a vote for "A little unnatural." Soon after a vote for "unnatural" appeared. Now I want to know why people think this! Hopefully someone answers it soon. Oh! Looks like they did. All within a half an hour I got an answer to my question, though it was in Japanese. 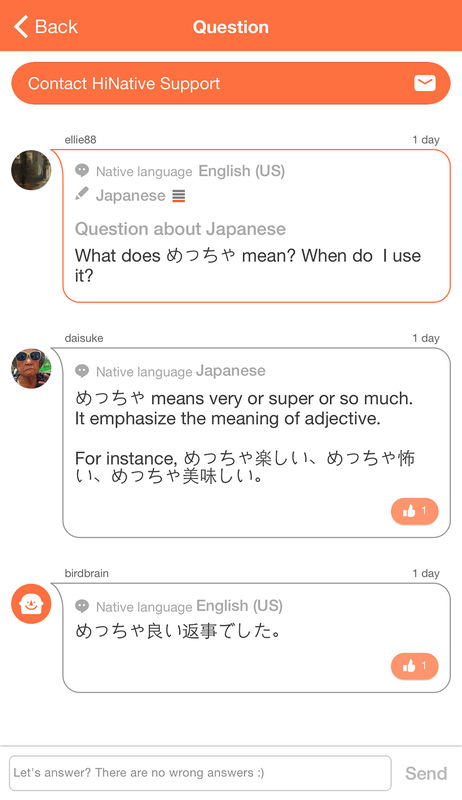 That's fine for some (and I think I set my fake account to be beginner/intermediate level), though the answer language is going to depend on who's answering. At least you could always copy the answer and put it into a question asking what it says, if you need to. (Just kidding, that will cause an infinite loop and break the universe!) It turns out I got another answer while I was typing this too, and this one is easier on my beginner/intermediate-level fake self. So plenty of useful information to help me to figure out that 滅法 probably isn't the word I'm looking for. This isn't something that I'd be able to figure out easily on my own, if I didn't know it! You certainly won't see a lot of discussion about the word 滅法 in English on the Internet. Question #2: Does this contain meat/fish? I thought this would be a good type of question. I took a picture of the back of a CalorieMate to ask if it contained meat. 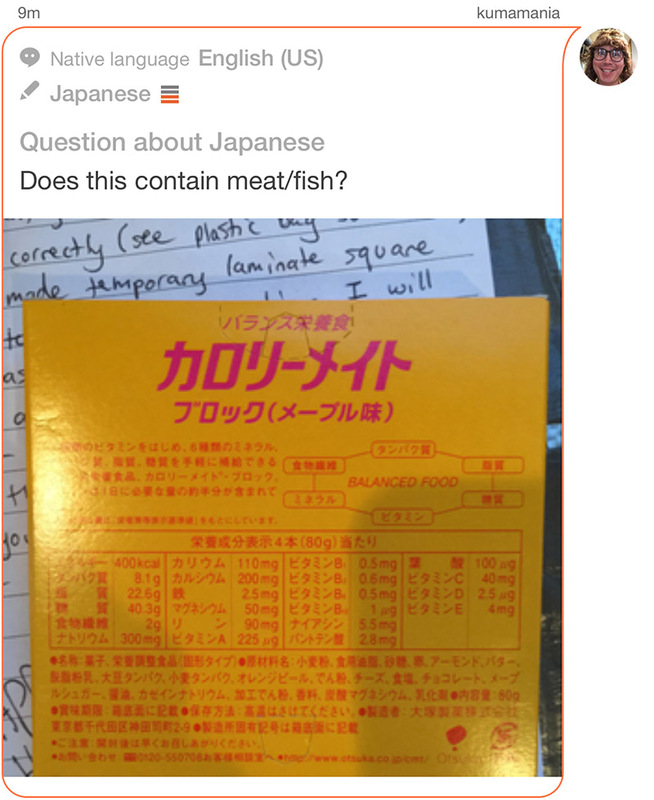 I could see someone doing this if they're a vegetarian visiting Japan. Within fifteen minutes of posting this, I got my first answer with another arriving a couple hours later. Once again, more information than necessary. I like! It's easy to imagine yourself taking pictures of things in Japan that you need more information about and uploading them to HiNative. Question #3: I will live in Japan for 2 years. What is the best overall mobile phone plan / service? This was an open question—not about language at all. I wanted to see if people would answer this kind of thing for me. These kinds of questions are nice to get answered, because it's hard to know what service is good and what's not. Same goes for Internet and other subscription-based services. I was hoping to get some opinions here, and I wasn't disappointed. This one took a little longer to get a first answer, but one appeared within a couple hours. Not bad at all. I was hoping for some more decisive answers, but I also understand why people tended toward "it depends on your situation / location." I probably should have asked about Tokyo or something more specific. Priority Tickets: You get ten priority tickets a month that you can use to boost any question to the top of the feed. 99% of priority questions get answered immediately. Bookmarks: Save questions in a bookmark list for later study. If you're on HiNative a lot, this could be a great way to gather SRS material. Listen to All Voice Content: Unlock audio on other people's "Show me how to pronounce" questions. Remove Ads: No one likes ads. Search: Instead of asking a question, see if other people have already answered it. Notifications on Other Peoples' Questions: Get notified when a question you're interested in gets updates. For me, the priority tickets are the most important, just because I don't like waiting. That being said, HiNative is already pretty speedy, so for now premium status is going to be reserved for power users or those who want to support HiNative's development. The Real Question: Is HiNative Any Good? I was hoping my test would reveal some flaws, but all three questions passed with flying colors. They were answered quickly, accurately, and it was really easy to ask the questions too. Although this was a very small sample, I have used HiNative in the past on a personal account to similar results. I'm sure that not all questions are answered in an accurate and timely fashion, but that's to be expected. Nothing is instantaneous… yet. 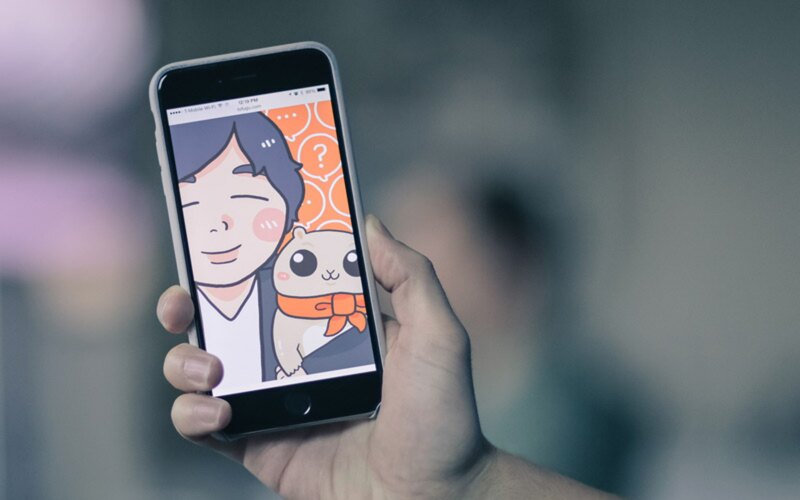 As the service grows and more users sign up, the quality and speed should increase as well. If there's one thing the people of the Internet love doing, it's correcting people's mistakes. There are also a couple of shortcomings, though nothing too serious. In fact, many of the issues I had when originally writing this review—such as lack of desktop and Android support—were addressed in subsequent updates. I tested the audio questions when they were added to the service and got quick and helpful answers, just like with the examples above. Basically, HiNative just keeps getting better. All in all, HiNative does exactly what it sets out to do. You can get your answers about a language / culture answered quickly and accurately. I can imagine two types of users already: one who actively asks lots of questions and uses HiNative as a study tool, and another who just occasionally asks questions when they need something answered. Whoever you are, HiNative works well and is a pleasure to use. And, because it's mobile-first, you'll be able to use it on the go. 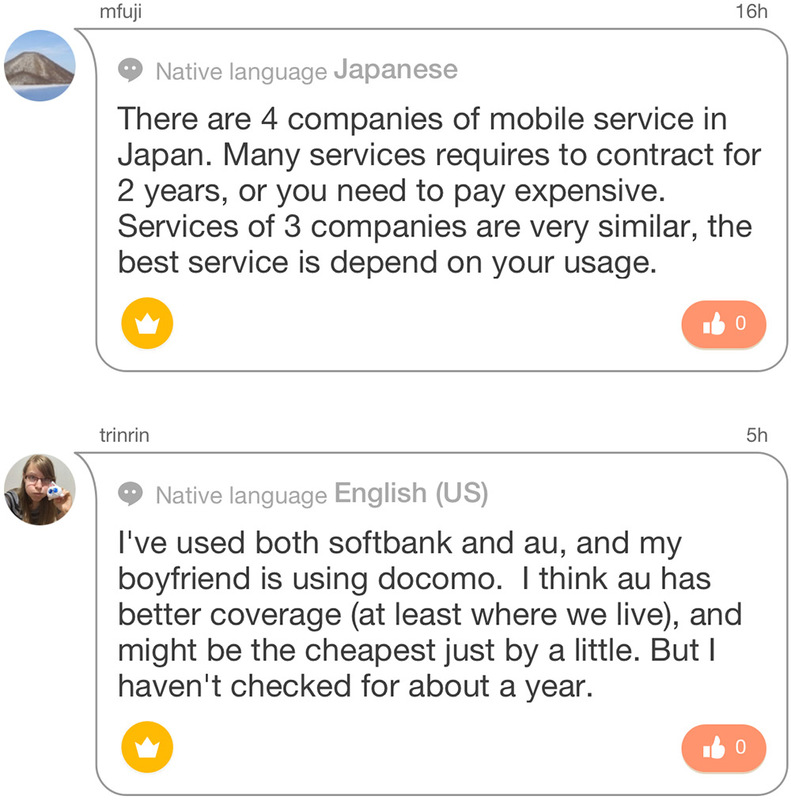 We really like HiNative at Tofugu, and we think it's the perfect supplement for someone following our roadmap to Japanese fluency. There are some (very) minor shortcomings, but with the constant updates and improvements, we look forward to seeing what they do next. If you can use some common sense and question screening abilities, HiNative is incredibly useful. It’s pretty one of a kind in terms of how fast you’ll get answers and how easy it is to use. Plus, it isn’t attached to social media platforms, so you don’t have the added pressure or embarrassment that comes with asking questions on other sites. I like how quickly I could get an answer from a native speaker, but sometimes I’d get responses from non-native speakers. It’s strange, but I had non-native speakers trying to correct my pronunciation by recording theirs and sending it to me, even though they obviously had much stronger accents. This happened more than a few times. It’s still a great free app, but you may not get the correct answers you’re looking for, which is why I rated it as 7. This is an excellent product… if you use it. If you do so every day, then you’ll get smarter and better at Japanese.